it’s for my Motorola Q phone! I love your car creation. It’s really cute. Actually it’s not a long time I’m knitting and i’m an addict now. 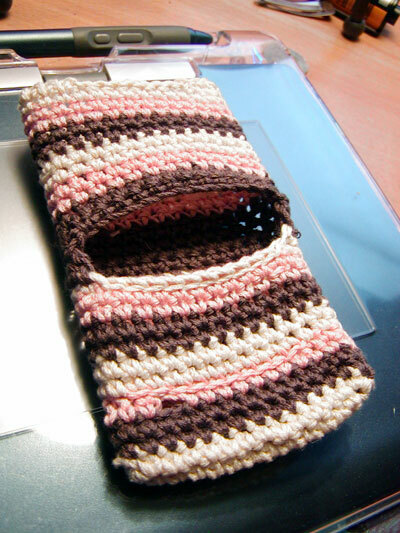 But I want to make creative clothes that’s why I love so much your idea of mobile sock. If you looking for original things have a look on this web-site http://www.kokobino.com where there are knitting kits with nice patterns. Maybe you have already tried it. Looks great in the stripy-ness! I looked at kokobino a few months ago. Now I need to knit something for a new baby girl and I can’t get on! Seems the site has closed. Does anyone have the patterns for the mouse and the lovely dress-coat at all?